May your home be a haven of blessing and a place of peace. Sanctuary. First thought is often a large, high vaulted room for worship. Look deeper, and sanctuary encompasses so much more: safe keeping, growing relationships, purposeful furnishing, meaningful space. Furthermore, sanctuary means a place for others to find peace, shelter and safety. At the heart of sanctuary is relationships. The relationships are multi-dimensional, encompassing every aspect of your home: spiritual, interpersonal, spatial and material. Exploring these relationships, I hope to inspire you to value your home's worth to you, your family, and all who enter. Spiritual Relationships: In what ways do you relate to higher beauty and order in your home? Do you have books, objects or art that lift you beyond the mundane and ordinary? Music and art often intersect with rush and clutter to bring us to a place of joy or appreciation. In our homes we can breathe in a spirit of wholeness, becoming one with ourselves in relation to the source of our grounding, confidence and hope. Interpersonal Relationships: Do the relationships among people who live together deepen in understanding, empathy, shared experience, and justpeace (the interconnection of justice with peace)? We do not have to see things alike to grow in these things. We can be in different places and still grow. The key to growing closer is honoring the other and knowing that problem-solving is more than either-or thinking. When considering your house as a sanctuary, also remember relationships with people who come and go, like the plumber or the house cleaner. May all feel blessed in your house. Spatial Relationships: How does light flow and air move between things? Through principles of feng sui, some people arrange their home to enhance flow of energy and light. Other people move things around until it "looks" or "feels" right. However you place things, intentional or random, how our space breathes makes a difference in our energy. Fear or loss of control cause us to shut paths of light and energy while openness clears paths. When cutter grows,window shades close, beginning a cycle of hidenness which manifests in fear and shame. Our relationship with our space makes a difference in our health: mental spiritual, and physical. Material Relationships: What is your relationship with the material things in your home? Within a sanctuary, things are chosen and used with specific purposes. From furniture, to candles, to art, to books, there is a purpose.behind their presence. However, once my brother-in-law interviewed to become pastor of a particular church. When he asked why they kept an old pulpit and chancel table and chairs in the back of the sanctuary, they could not give him a clear reason. To Andy, this was a warning flag about the church. Although they spoke about future growth, their commitment to material possessions indicated they were stuck in the past. How do your possessions most reflect where you are going? where you are stuck? where you have been? The core of sanctuary living is internal. It is the place where you live transparent to yourself with your creator. Our danger is to think that happiness will come from outside of us, from the things we possess or the power of our group, and not from within us, from the inner sanctuary of our being. As a professional organizer who specializes in chronic disorganization, I know about clutter. As a survivor, I know about being an inside mess that is reflected as an outside mess. As a pastor, I know about grace and regeneration. FYI, I’m a messy by nature! Part of my DNA. For a period, it became extreme. Read on while I tell you about it. It can be the baseline for our shared journey. While parenting three school-age children we kept a messy house. Not dirty, just messy. With an average amount of clothes, toys, games, and electronics, we had an ocean of things on every horizontal surface – stairs, tables, floors, sofas and chairs. All five of us would walk over and around things, seemingly unaffected. But we were affected. Not just when we were having company! Over the next few years, prompted in part when we were fired as clients of the Merry Maids (we didn’t pick up the house enough for them to clean the house!!! ), we came to understand that our mess was reflecting an internal mess, mostly mine. I sank into a funk and things were overwhelming. During the next 10 years, two layers unfolded in our lives. One layer went through my PTSD diagnosis and recovery. The other went through the physical clutter of the house, family priorities and schedules (did one of my kids tell you about the time I forgot to pick them up?). For a while, there was serious chaos, tinged with confusion. But, over time, as I became aware and healed, things were getting calmer, we were growing in affirmation of our family strength and respect. Over more time, we realized our physical space reflected this growth and change. Healing happens, and messes became controlled, not controlling. There are a few things I want to point out as you process this autobiographical story. First, sometimes a mess is just a mess. Life gets hectic and we throw things on the bed, and from the bed to the floor, and eventually things calm down and we tackle the mess. This is normal. Next, sometimes a mess is on-going and cumulative because there is an underlying cause. People with ADHD tend to lose focus and messes meander, unaddressed, around the house. Creative types tend to have multiple projects unfolding around their space. Families with small children tip-toe around legos and bags of out-grown clothes. People with illness deal with limited energy and extra bottles and equipment. This is explainable. However, some messes bother us to our core and cause us to turn inwardly or to react outwardly. These messes may be trying to tell us something about our life energy. We can learn to quiet ourselves and listen to what the mess is trying to say. Mess can open dialog toward positive change. Do you have mess that is no longer welcome in your daily life? I offer you the opportunity to address both the internal and external through Clearing the Way Home’s services. Affecting change starts with you. The day I came up with my clutter retreat title, I loved it! It opened a new consideration of the build-up of clutter in our lives and, especially, a new way of understanding the dynamic of clutter release and the outflow of increased engagement with our life force. "Dammed" clutter. Isn't that a great adjective for the backlog of things that pile up in our houses and in our minds? Two descriptions for the same stuff! From the beginning I saw an energy generating dam, not an earthen dam or a beaver dam. But TVA at its finest. Immediately I saw the things that were damming up, and almost as quickly, I saw the things that flow through when the dam is released. The first question I asked was, "How safe is the dam?" Will it let loose and flood everything? To this question, I realized that the first dynamic in addressing clutter is being supported safely. Without safety, addressing the things held back remains precarious. When I spent years not feeling very safe, people became the support for me and let me address the backlog of emotions, fears, and trauma that demanded to be addressed. Next, with safety in place, I looked at the held-in clutter, both physical and mental, and gave memory to its presence, understanding piece by piece how my life got to its current place. Finally, I realized that there was a spillway beneath the dam, and I control its opening and closing. With time, I learned to better control the movement from one side of the dam to the other side, creating an energy that was useful and could be shared. Much clutter begins with a traumatic experience. We do not wake up one day wishing that we could clutter up our house. Usually it happens one delay or indecision after another, until we wonder if we'll ever be able to choose a way through, and then beyond, the dammed up clutter. You can. In a coordinated journey with a variety of people, breath (spirit/pneuma/ruach), and healing ways, the cluttering of mind and space can begin to clear. Dr. Judith Herman, author of Trauma and Recovery, speaks of 3 stages in recovery. The first is safety, where a person becomes physically safe and emotionally grounded. The second is remembrance and mourning, allowing ourselves to engage with the particular dynamics that led to where we are today. Finally, reconnection allows us to become peaceful and reconciled with ourselves and reach out to others. Now I will share with you my graphic story of decluttering mind, body, spirit and space. 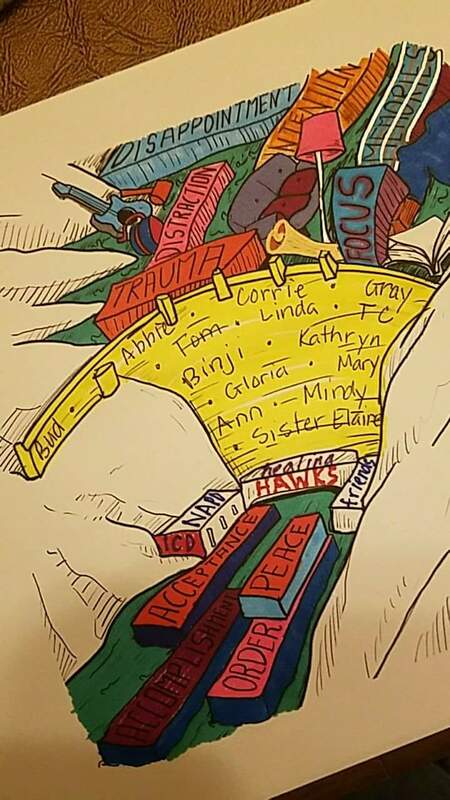 The above picture is now colored in and you can see the dam held safe by people who cared for me across years, the spillway where I was guided safely through, and the power stations where I transfer energy from myself to others. Your clutter can bring pleasure. If you do not find comfort or confirmation in any of these, I encourage a journey through your clutter in a combination of ways. To make a plan, you can "Talk it Through" with me. If you are in the Nashville, TN area, work with me in your clutter or attend the March 24, 2018 "Dammed Clutter Retreat". Wherever you are, find an anchor of safety and support and take a step forward. You are not alone and no amount of clutter has stopped you yet!! There is no stopping now. Reach out.